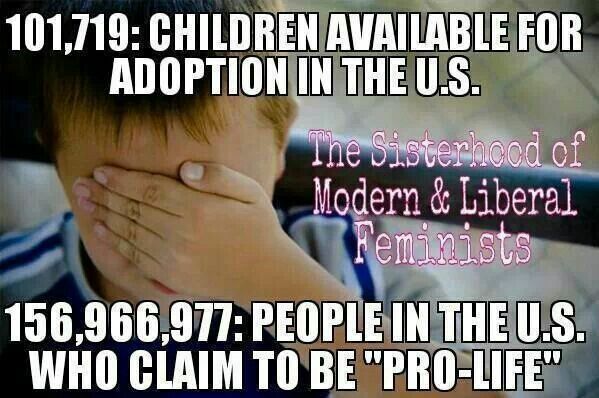 Ah, abortion relief. I had it the moment I woke up after mine. And I have it now, too. 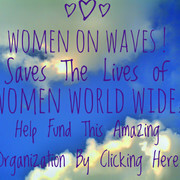 I have tons of different type of videos on my YouTube page that discuss my abortions (yes, two) from multiple angles. I also have my abortion story. I’ve been asked if I could type it as well, so even though I am late; I going to do so now. Before I start I hope every one will consider what Lizz Winstead says in the photo to the right. My story is a bit dramatic I guess because I would have ended my life. But no matter what the case; be it you want to finish your degree or you just don’t want kids, or now simply is not the time for whatever reason- THAT IS JUST AS JUSTIFIED AND OKAY AS HAVING AN ABORTION FOR ANY OTHER REASON. 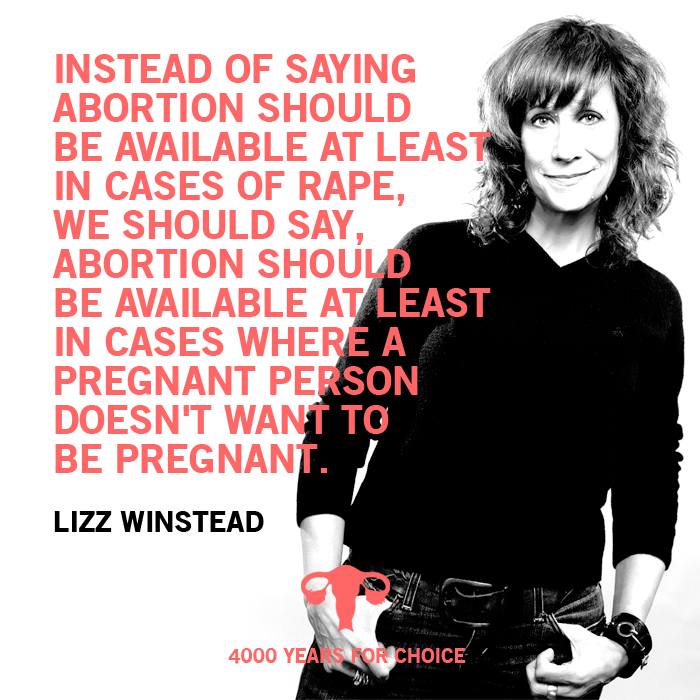 Let’s not just stop with a photo, here is a video of Comedian, Writer and Activist Lizz Winstead speaking out on her 17 year old abortion. This post started, randomly. Right now, this morning, I felt a wave of gratitude pour over me as I remembered I am not a parent. Now, I have the most amazing nephews in the world. The one staying the night is 2 years old, and endless energy; wanting to learn, play, repeat games, make new things, try everything, and seems to never get tired. I love hanging out with him, and there’s no way I could ever let any harm come his (or any of my nephews) way. But he needs attention and time…well, all the time from his mom. So while me and him play often as possible, I don’t have to deal with the hardships of raising a child. Now before I go on, I must say, I have the most amazing sister in law ever. And the same for her brother, my brother in law. Both are extraordinary and I wish I had it together mentally like they do. But I digress, back to her. This morning as I was reading in bed (insomnia!) I heard him wake up, it’s very early, and she was in the happiest mood. She was playing with him, making him laugh, honestly being an amazing mom. And this is when my abortion hit me. Listening to her and him play and wake up together, I first wondered how she does it; how does she stay happy and positive with hm even when frustrated, tired or other? Of course I never have to deal with it, I always play with my nephews when they are happy. But a mother’s job is full time and she handles it like a pro. He then began to cry. Loudly. And she remained calm, comforted him; he was fine. Amazing… But had this morning I been woken up or disrupted from my reading or work in that way, I am pretty certain I would have broken down, sobbing. 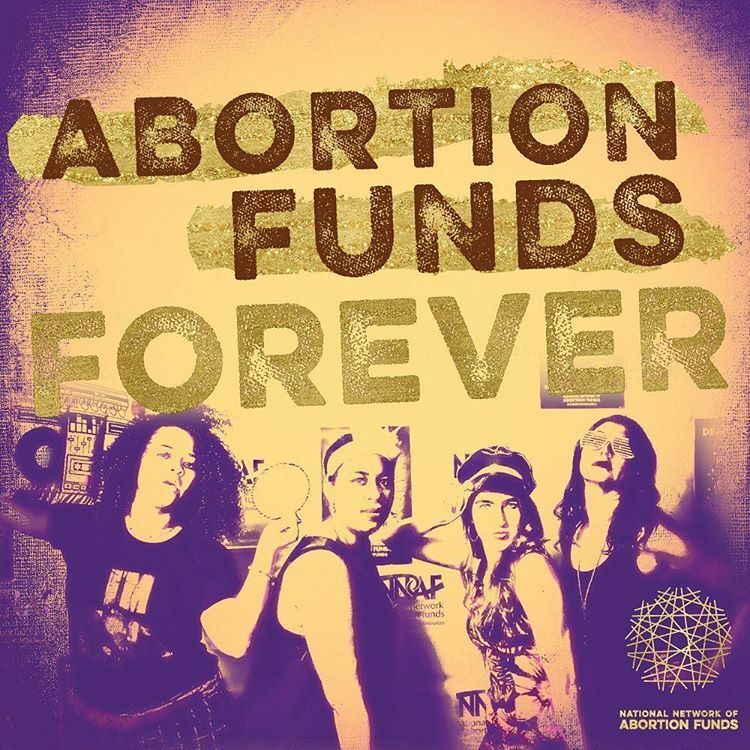 I felt such relief that I had had my abortion. Not just for myself, but because kids deserve mothers like her; not one who is unready, unsure, unstable and simply not mentally/emotionally ready. So let’s go into my abortion story now… I’ll include the link to MY ABORTION STORY here (opens in new tab/window), but for those who would prefer a written version…Here we go. 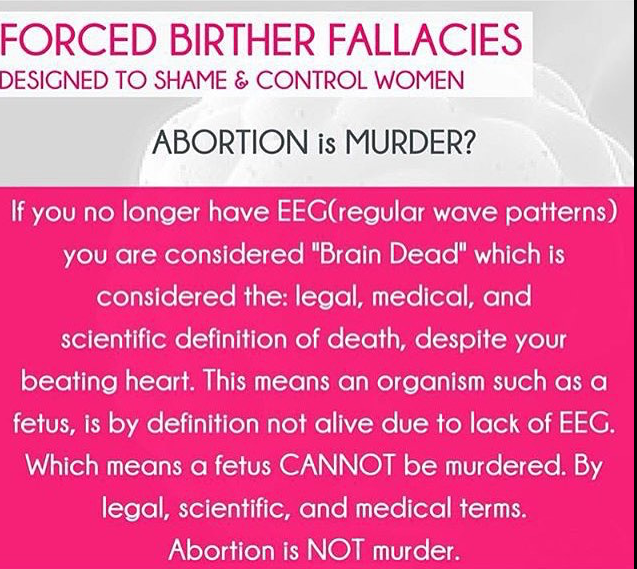 Despite anti-abortionist and anti-choice lies, no medical or scientific study has found a link between abortion and mental illness. Actually, it is more dangerous to carry full term an unwanted pregnancy. And if you want to speak of mental health, women who do give birth, whether they wanted it or not, are at a greater risk of developing mental illness or having long term mental problems. I am not saying or hinting the phrase ‘don’t be a mom’ – what I am saying is, I do believe it to be vital for a woman to be ready and want the child; to be prepared physically and emotionally, as well in so many other ways. (I say none of the following wanting pity, sympathy, etc. I say it because it is true and relevant.) I’ve survived almost every abuse there is, I’ve been through more things before the age of 10 than most people will experience in a lifetime. But in order to survive, of course I needed (and still need) coping mechanisms. Most aren’t healthy; in fact most are self destructive. But it gets the job of stopping flashbacks done, and back during my childhood it helped me cope with situations I couldn’t understand or handle. When I found out I was pregnant my husband and I, we were both thrilled. But it only took a matter of days before my mental illnesses began to increase ten fold. I’ve always kept a journal, since I was 6. I kept a journal throughout this entire ordeal. And if you read, you watch me quickly falling into a state of despair unlike any other. I’ve been doing some form of self harm since age 4, and still do, but even for me the thoughts of what I should do to myself were beyond me and my normal self hatred. I wanted so badly to please my husband; though he was not ready yet, either, and later admitted this. I felt if I aborted I’d be letting his family down and worst; him. So I kept on trying. But my self hatred was growing worse. All day and night I would lay in bed and sob. I remember thinking if I were able, I’d open myself up and remove it myself. Then it turned even darker. Alone, constantly worrying about family issues both here and at home, I gave up. Suicide was the ONLY THOUGHT that brought warmth to my heart; the only thought that made me happy. I’ve attempted suicide before; but I didn’t really want it to work. This time, I wanted nothing more than for it to work. At this point I began to search for abortion clinics. I’m not a saint by any means, but I’m also no ‘cruel demon’, so I can say with all honestly I did try to keep the pregnancy thinking it would make him and his family happy; but my mom saw what it was doing to me. She was formerly a mostly anti-choicer; but she at least wasn’t one that harassed women. Anyhow; she is the only reason I was able to get to the abortion clinic, every day of the 3 days Texas then required (this was 2 years ago). She after seeing what pregnancy was doing to me, and that I needed to abort or she would lose me, she has changed her mind. She actually researched abortion as well, on her own, I recently found out… She now supports a woman’s right to choose. My suicide was planned and a secret. I don’t feel it is wise to tell my plan online so I won’t, but I assure you, it was fail proof. I was close to the deadline; money was tight, and had I not been blessed to get the funding help I needed, I know without a shadow of a doubt I would not be alive today. I did see my sonogram, yes. I cried, yes. The night before the first day of the procedure I stayed up all night writing out reasons why to, or why not to. I had to make a choice that night- there was no time for putting it off as I was closing in on my time limit. In the end, I saw it was far more moral towards myself, the fetus to be child and family for me to abort. If nothing else, seeing that sonogram made me fall in love with him and realize, he deserved so, so much more than we had to offer; than I had to offer. It was not an easy choice for me, mainly because I wanted to be a “good woman” (my definition of what a ‘good woman’ is has since changed greatly) and do make everyone else happy. But the cold facts were in my face. Facts I knew all along but couldn’t admit because I didn’t want to lose anyone. Those facts can be summed up in one sentence. I AM NOT AND WAS NOT READY FOR MOTHERHOOD. Leaving out tons of issues, such as my career goals, school, money, a place to live, support, isolation and other issues; I’m going to mainly focus on mental illness. I have a few mental issues (which is normal when you’ve had a prolonged, traumatic life) from childhood (a very similar one that I did not want to bring a child in to) to cope and heal from. First of all, for myself; secondly for others, including any children I may have. I need to stop self destructive coping mechanisms, I need to be ready… And my spouse does too. Stress has to be something we both cope with positively, there is so many things to think about when considering having a child… Quality of life is crucial; forced birth is cruel and inhumane for both the mother and child. Having a child is life altering, completely life changing; and it would have been wrong for me to go through with the pregnancy for everyone but myself. Everyone but myself that has the option to walk away. (This is all speaking as if I would have lived, a “what if” scenario). Not being ready for a child does not make you a bad person! It does not mean you are a wreck and haven will never be a mom. And the same applies to those who don’t want kids! Some women want to be a stay at home mom, or a working mom. Others can’t stand kids (Lizz Winstead Lizz Free or Die – best book ever and she touches on this a lot…her story in part is in the above video). One last thing… I find it interesting that we get called child haters when most women, 6 in 10, already are mothers and can’t handle another child. When all your heart, love and soul is put into deciding what to do for yourself and what is developing inside you. A woman knows deep down what is right for herself, what is right for the to be child. No one, not me, not an anti, has the right to make her feel guilty or influence her in any way. It’s her body, her life- and only she knows best. It’s her choice, your opinion, the government’s opinion should not and does not matter. 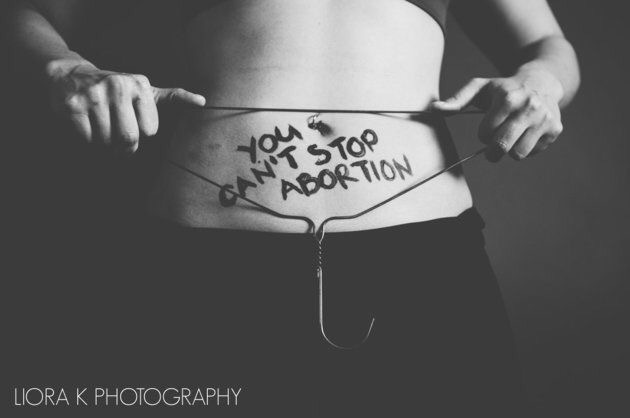 Abortion is never going away; it’s been around for thousands of years. Only recently have zealots and people who don’t respect medical findings claim they fight for “life” and they are all for the embryo or fetus. That’s BS and you know it as well as I do. If they cared about life; especially CHILDREN’S lives, they would be outraged by things such as; Baby Bou’s situation (see video and link below) or by a 12 year old shot by the police on video while doing nothing but waiting or the child being abused tonight because he wasn’t wanted in the first place and the father’s left the mother to raise this unwanted soul on her own. when really it’s about keeping a woman in her place. But they aren’t concerned with any of that. Below is a video and also a link about Baby Bou’s situation (he was 19 months at the time). And for the link to his page where you can help out or just learn a bit more on his progress…Click here. This has nothing to do with life; this has everything to do with women, and fear. 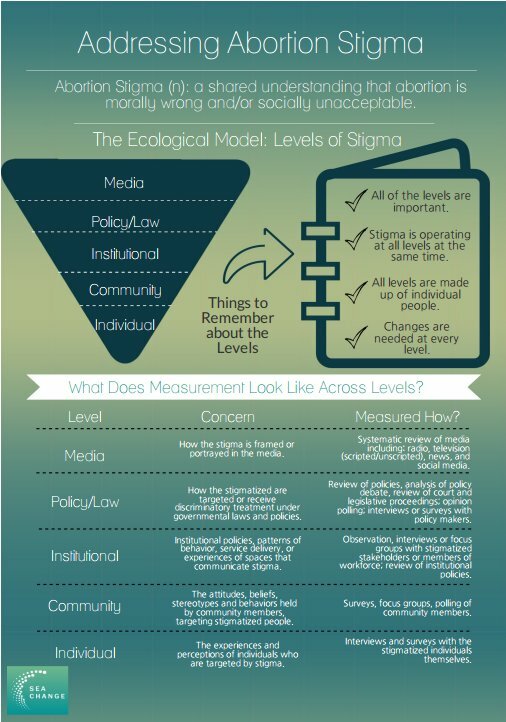 Posted on November 28, 2014 November 28, 2014 by Lady MakaveliPosted in Abortion, Abortion Stigma, family, Me & Abortion Stories, Mental Health, pro-choice, Suicide, Voices of Women, War on Women, Women's HealthTagged 1in3speaks, Abortion, abortion is not murder, abortion stories, abortion video, embryo, Fetus, forced motherhood, mental illness, my abortion story, post abortion, Pro-Choice, Pro-Life, suicide. Previous Previous post: December First Pit Bulls & Rottweilers Set to Die in One Small Town…The Reason? Next Next post: STL Pregnant Woman Loses An Eye Due to Police Abuse- but Anti’s Aren’t Outraged. Wonder Why.